Today was one of the days I enjoyed most in my visit to Asia. I saw several beautiful places far away from people. I had heard about some waterfalls and a marble elephant. We rode the bike back in direction Hue. We tried to explain “waterfall” with gestures. I drew an funny elephant on a paper. We were given some directions. We drove on tiny roads that I thought would not take us anywhere. Rice fields, chicken, dogs and some kids saying hello. We hiked in a path with orange dirt. I wondered about land mines. Then this transparent water flowing down from the clouds on the hills, and huge round rocks. Few people building wood platforms on the sides of this river. A guy moving a large rock with chains and a manual mechanism. We couldn’t find waterfalls or elephants, but when I sat down I knew I had found what I wanted. I was far away from people and cities, sitting on a big rock with my eyes closed, hearing loud water sounds all around me. The wind in my face suddenly reminded me of the nature in Finland and all kinds of good feelings related to nature. A big butterfly with amazing metallic blue wings landed near us to have some of our sugar cane. When not flying it looked like a dry leave, hiding all its beauty. Later on the same day, we crossed the dunes and saw the Pacific ocean. Kilometers of sand hidden in clouds generated by the waves. Alone in that beach, mountains with clouds below them. Even the plastic trash on the sand looked beautiful at that moment. 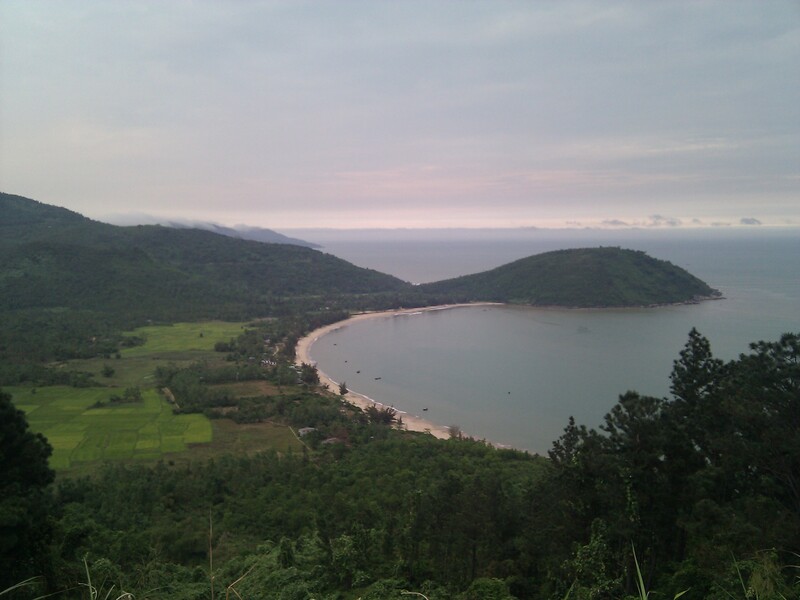 Then we leave and start driving towards Da Nang. Trucks and cars go through the tunnel, so this beautiful curvy road is again just for us. Trees are impossibly green. We drive into the clouds. Cliffs, rocks and sand in the horizon. Curve after curve our deposit is getting empty and we are getting colder and colder, but the feeling of astonishment is stronger. Like every day, we arrive to a new unknown place.